Join us for our annual pub quiz! 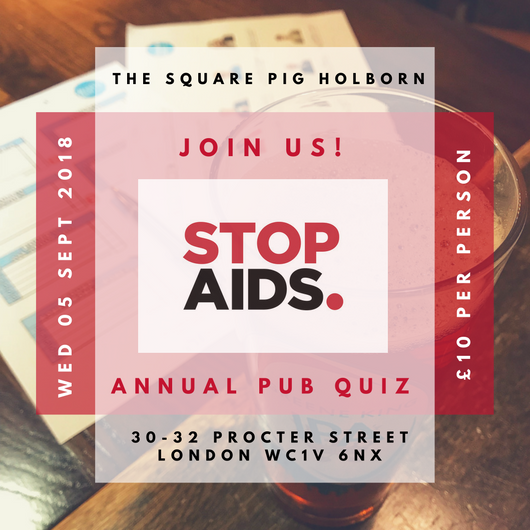 HomeNews & EventsJoin us for our annual pub quiz! After the success of last year’s pub quiz, where we raised an amazing £1200, we decided to make it a yearly event! Join us for what promises to be a really fun night, filled with drinks, prizes and trivia. There will be lots of great prizes up for grabs in our raffle too. You can reserve your team or individual place here, tickets will be £10 per person on the door. Teams should be made up of 5-8 people. If you don’t have a team yet, don’t worry! You can reserve your ticket and we will find you a team. Email karris@stopaids.org.uk if you have any questions.